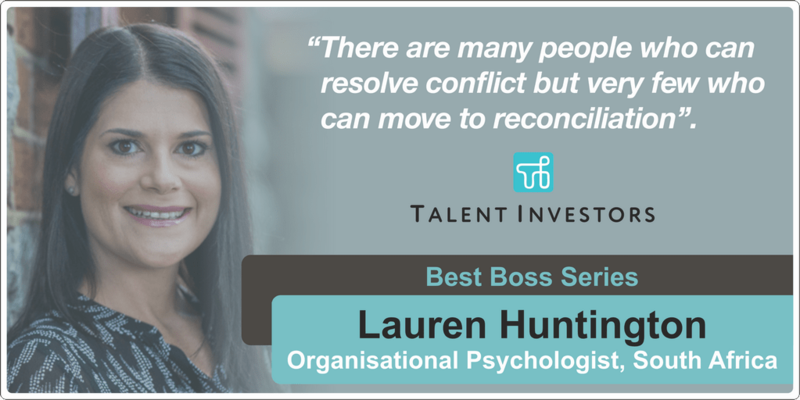 As an organisational psychologist, Lauren has a deep interest in the cornerstone role of human capital in the success of enterprises. Her passion lies in unlocking the potential of individuals and teams by working with client organisations to enable their people strategies. 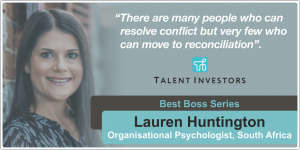 She started her career as a registered I/O psychologist in internal human capital specialist roles then quickly was promoted to leadership roles, gaining an early appreciation for the inner workings of the employee lifecycle. Lauren has a keen interest in emerging markets. She has worked across Africa for the past decade with a focus on the Southern and Eastern regions as a member of two eminent global consulting firms. Tell me how you define a successful leader. Success is a ‘big’ term in my books… it’s not a once off moment, definitely not a title and rarely reflected in archaic accolades. I would define a successful leader as someone who has made a sustainable, positive impact on the triple bottom line. I define a successful leader as someone whom people rally around, not because they are forced to, but because that individual is respected for an authentic and invested interest in the success of the organisation, every single member of the team as well as the community in which they operate. There have been the formal, public moments… let me provide two examples. From a people leadership perspective, it was when I was awarded the ‘stewardship of exceptional talent’ by my peers or from a thought leadership perspective when myself and an esteemed colleague were selected to be the first to debate LGBTQ+ diversity programs at the annual conference for my chosen profession. While I am proud of these moments, these often feel like part of what my roles have required of me. It’s the private, surprising moments – the ones that catch you off guard -which make you realise that you have made an impact. I remember one of my team chatting informally to someone who was struggling with their manager. She started by saying that when she first started working with me she found it hard to follow me. I giggled quietly. Then her tone changed and I’ll never forget the words she used – she said I had a ‘greater plan’ and she was so grateful to be part of it. She said hindsight showed her the power of both my actions and inactions – a careful orchestration towards end goals. For her personally, she said I was steps ahead in anticipating the challenge or stretch she needed before she had the insight herself. The story wasn’t meant for me yet at that moment I realised the depth of trust a leader can gain. Personally, this has been maintaining my own character through the trials and the triumphs. I often find that ‘leadership’ can be a specific mould that people aspire to – one that can feel a bit too polished and even a tad insincere. I think my greatest personal success is being able authentically to connect with a wide range of clients and teammates – across industries and across geographic boundaries – without ever losing my sense of self or comprising my own ethical fibre. From a team perspective, that’s an easy question. My greatest success is witnessing the success of those whose career journeys I have been part of. Watching people learn, grow, invent, and – in those truly special moments – live their purpose. It gives me a great sense of peace that the all the hard work may have enabled precursors that allow people to express their potential. There is nothing that brightens a day like knowing that a recommendation you gave meant a talented individual was initiated into Big Four consulting by being told she had ‘pedigree’ as she has been managed by you. There’s a great pride in knowing that bright young people who started off in a program you started and managed for interns are now leaders themselves and blazing bright new trails. My cornerstone challenge has been finding peace about things I could not change. There were times I invested a lot of energy in trying to turn big ships that were not mine to turn. It’s a difficult lesson to learn to know when to walk away. I recall a few times working in situations where I had a fundamental clash of values with an executive who had an iron-clad grip on the context I which I was operating. There are a lot of things that can be resolved over time in organisations – you can change mindsets, you can train skills or you can increase capacity. What’s far more difficult, is to operate in toxicity that trickles down from value sets with which you simply cannot agree. There are times when walking away is doing the best you can for everyone. My second challenge has been finding patience for apathy. When there is energy (whether positive or negative) it can be directed, redirected, changed and channelled. Where there is no passion or will then it’s like lighting a fire with two twigs in snowstorm – hard work and not very effective. It takes real perseverance to ignite passion where it has been extinguished. When I encounter this now I am now a lot more realistic about the time and effort that it can take to change apathy. Who has been your greatest mentor(s)? Were they a colleague or did you hire a professional coach? What about this person or the experience had the biggest impact on your growth? I think the mentors that have had the biggest impact on me have been people who believed in me when I did not believe in myself. It took me time in my career to gain confidence. I managed to walk away from glowing feedback feeling like I could do more. I remember in one of my first performance reviews being told by my manager to ‘slow down’ so he could ‘catch up’ and still thinking I must have done something wrong. When I first landed my dream job I remember feeling like an imposter. It was only when people who I truly admired and respected refused to accept my own humility. I recall a top executive of a mega-company that would not let a meeting pass without hearing my opinion. I remember directors apologising to me that they had not done enough to retain me. I remember an MD who once when I was having a rocky time in my life, said they he needed me to be the person he loved to work with – making me believe that no matter what life was throwing at me – I deserved to be the best version of myself. Common opinion states that in order to succeed in business one has to be ruthless. A quick survey of world’s most domineering companies seems to support that view. Do you think it’s possible to be very successful in business and still be a nice person? When times are truly tough, adherence is key and underperformance need to be managed then I take a tight approach to stricter controls and additional oversight. While this can drive results in the short term it can also lead to burnout of teams and under-realisation of creative potential so more of my energy must be devoted to turnarounds for the longer term. When times are more abundant, creativity needs to be unleashed and when you are working with more self-directed individuals then a loose approach is enabling. Here additional my energy must be devoted to keeping the team connected to the goals and providing clear direction so as not to allow for a loss of focus or lackadaisical attitudes to emerge. Let’s talk about managing pressure — how do you control your own emotions and temper when things don’t go to plan? Not lashing out on those around you is a skill — what are your tips? It does seem to be commonplace in corporate these days for many to be operating on a short fuse. In my roles, I’ve certainly experienced high levels of stress and pressure. That being said, I don’t believe this is anyone else’s ‘fault’ as this is my chosen profession and role. My first tip would be to remember that you may not be able to control the triggers but your reaction is in your control and, as a leader, is your responsibility. I think it is easy in the midst of stress and pressure to lose empathy and awareness. When things don’t go to plan I go into a ‘mode’ where I consciously decide to facilitate the resolution of issues that may not have been of my own doing. I take on a diffusing role – reminding others that respect is non-negotiable and not fueling fires with my own frustrations. I try to redirect all conversations from finger-pointing to root cause to move the conversation from catastrophising to creating options. It can be very draining but I’ve been able to navigate projects through some difficult times this way. When I was doing my second Masters degree at the business school recently, I recall an incident where my extremely sleep deprived group were all on their last nerve before a pressurized presentation and the situation spiralled. I went into my ‘mode’ as I had been doing for many years as a consultant and a manager. One of my teammates said to me afterwards that there are many people who can resolve conflict but very few who can move to reconciliation. It was a high compliment from an esteemed fellow student. It made me realise for the first time, despite how draining it had sometimes been, how valuable the skill had become. Refresh. I may take a time out – a walk around the office, a weekend meditation retreat or a trip to somewhere unexplored depending on how deep-seated the issue is I’m grappling with. This gives me the opportunity to ‘top up’ with energising thoughts and actions. Reframe. I really love the Afrikaans saying “more is nog n dag” (literally translated tomorrow is still a day). For me, that’s not about putting things off but about remembering that everything is not solved in a day. Sometimes it takes a bit of time to get perspective. Motivation is not always about changing a situation but being able to find the purpose in difficult. As a very concrete example – very early on in my career I was part of a large-scale retrenchment. It took time for me to think of it as an opportunity to ensure fairness, dignity and respect in a difficult time rather than as a test to be endured. Reengage. There isn’t often the luxury of full energy and total perspective before I realise that it is simply time to dive back into the situation. I’m always looking out for the critical moment where I need to re-engage – even if it means a little bit of ‘faking it till you make it’ while I find moments to refresh and reframe in the background. I don’t believe my development as a leader is any different from my development as a person. I’ve read quote voraciously all my life so it’s impossible to pick only three! Every book I have read – be it fiction or non-fiction – for fun or for academic purposes – have left a mark. I personally would not stay with a business that does not fundamentally recognise people as the cornerstone. If an organisation has lost sight of the importance of its people then I see it as a duty to be outspoken. As a leader I serve on behalf of my team, my team trusts me to advocate for them where they may not have the influence to do so themselves. If decisions are being made at more senior levels, I always try and ensure that I am representing the voice of all of those in my team – even if that may be unpopular or difficult to do so. It is because it is known that I have certain ‘non-negotiable’ principles that people continue to work with me when the company culture is not ideal. That being said, I don’t believe it is my role as a manager to ‘make’ people want to work for me or in my department. I see my role as creating a conducive and challenging environment – which may not fit every person at all times. As a leader, a fundamental part of coaching is to create insight for each of your team around their ‘fit’ and supporting them in pursuing their best ‘fit’ – even if it means losing them. Honesty. Don’t make promises you can’t keep. Educate yourself as a manager about how bonus, increase and promotion processes work. If they aren’t well defined or poorly crafted then find a way to make it fairer and more transparent for your team. Managing expectations is key. Managers are often less in control of bonuses and pay amounts than their teams may realise. In addition, there are often a lot of linked extraneous factors (such as M&A) that are making bonuses and increases less predictable. As a manager, I cannot promise that the extrinsic reward will be higher or lower than what you want. It is, however, my responsibility to keep expectations aligned to what the organisation is able to fairly provide and keep my team up to date on changes in the process that impact on bonuses or increases. As an extreme caution, I’ve seen managers who, when they are able to provide large increases or bonuses – take personal credit and set precedents for future years. I don’t believe in using extrinsic reward as a shortcut to gain commitment, engagement or motivation – certainly not as an ego boost. It’s a short-term solution that often has long-term negative ramifications as it’s not sustainable. I couldn’t understand when I received my first big bonus that my director (a woman for whom I have immense respect) spend a half an hour cautioning around the factors that could lead to this not being the same the following year even if I performed at these levels. At the time, I thought it was odd as I just wanted to thank her (which she wouldn’t allow). Now I realise why. Some managers believe in strict hierarchy and the “do what I say approach”, sighting cultural norm as an excuse. What are your thoughts on this? I believe that the time for the ‘do what I say’ approach has passed. The era in which we operate is dynamic, complex and rules from above are no longer always serving our best interests. Consider the current #metoo campaign highlighting policies in multiple industries, including parliament in the USA, that force survivors of sexual harassment in the workplace to often be further victimised when they ‘do as the policy or the manager says’. It’s no longer enough to rattle off rules, SOPs and processes to try and govern every employee movement. Managers need to be teaching people how to think not what to think. My favourite question from anyone I work with is why… it shows the person is invested enough to ensure what they are doing is adding value. Allowing people to ask why helps the system to be reflective to know if its own prescriptions make sense or could be done differently. I think there is a difference in the manner in which it is done – in certain cultures this is more subtle and nuances, in others you may need to be more direct in order to be understood. I agree that culture plays a role but it should not be a scapegoat for lazy leadership. Team building has become a buzzword in the corporate world, yet many still not see the value in applying it to their group or organization. What are your beliefs and or successes around team building? I believe there is a balance to be struck between carving out formal times and spaces carve out for team building as well as allowing for spontaneity. When you operate in a fast past environment like I do, it’s easy to time as a team to be delayed or put off altogether. This is where it is important to ensure that there is always a formal time set aside on the horizon where the issues of the day can be set aside so the team can benefit from considering the longer terms time horizons and gain perspective. In our case, the business cycle is quarterly which is a good time to look at business performance more broadly. That being said, some of the most successful ‘team building’ moments are spontaneous moments where the day is called off early for a team to debrief and unwind or when the team decided to take a moment to celebrate a success in a memorable way or start the day with a breakfast together. My most recent teambuilding was last week with my team in Hong Kong, it was a macaroon making morning. The reason for this is that in this city we don’t have the luxury of large kitchens so baking is not a commonplace occurrence. It’s also an experience so completely different from our day to day (for our last Asia Pacific get together we went rock-climbing for similar reasons). Finally, you literally cannot have a laptop or a cell phone in hand while you are whipping a meringue or piping ganache. I’ve found that in the early days of managing any new team, I get inundated with calls, texts and emails – there is not often an inbuilt sense of which information I need as a manager to do my job effectively and even when true issues are raised it can be without context. My first step is to create a shared understanding of urgency and impact within the team. I often use the mantra ‘if everything is urgent, nothing really is’ to emphasise that not all issues are equal. I find that without slowing down the influx of fragmented information, you are not able to get the bigger picture and end up fueling a culture of knee-jerk reactions. Once the team has a clearer idea of priority and how to gather relevant contextual information, the second step is to ensure that the most effective use is made of processes that are in place or to identify where new processes are required. As a manager, part of the job is to make yourself redundant is daily workflows so that you do not become a bottleneck. The more effectively the processes serve the team, the more you should feel yourself freed up for more strategic work. If there is a perception that sending you an urgent text is the quickest way to ‘shortcut’ process – you simply do not create sustainable ways of working. Creating awareness of how to correctly engage with other teams to get the fastest turnarounds within the specifications required, empowers team members and allows them to operate far more independently. The final step is to prove the benefits to your team of effective prioritization and taking responsibility for their own process management. Share an example of how the autonomy of team members has allowed them to deliver faster or learn more. Gather input around which processes are working, which are failing and which are absent. Take the time as a manager you have gained to drive improvements and build the business for scale. How do you best separate work life from personal life — for a healthy balance? What are your biggest challenges around this? How does this impact you personally? This is an ongoing challenge. Although this isn’t an approach that necessarily works for everyone, I tend not to maintain strict boundaries around ‘work’ and ‘personal’. I usually integrate my work and personal life. There are times when one realm spills into the other and visa versa. There are ‘non-negotiable’ moments in my typical week – this may include time with family, friends or time for myself. I work my schedule around these moments. Every day I review my calendar critically – ensuring that the time allocation allows me to undertake any work outputs required with the energy that is fed from other time in the week. When the balance is skewed, I then try and balance it out the following week. Typical weeks can be easier to manage but that can be more challenging when you are new to a role or project or travelling extensively. As an example, when I land in a new city there is often extreme pressure to deliver or to manage the demands of a new team whilst carrying existing workload. Yet, in every city, I make an effort to explore an aspect of that city that I find inspiring. It helps me not only to be more astute to the local content but also to gather insight that can make me more useful to my team and my clients. When I’m coaching an executive approaching retirement, I can share the story of the Doctor who at age 70 started designing the Gardens on the Bay in Singapore – a shining legacy to his love of nature, his attention to detail and the extent of the power of vision. If I hadn’t left the office on time one day a few weeks ago and catch a cab with a patriotic cabbie who told me the story, maybe I would have responded to one more email but instead, I felt inspired around an approach to address coaching near retirement that I had been grappling with. If I lived a life trapped behind a laptop for 80 hours a week and didn’t gain the richness of life I believe that what I have to impart to my client and my team would be operational or bland. I believe people feed off energy and so my responsibility is to keep my energy alive not to allow it to ever run too low! I’m in a somewhat unique position, in the sense that these are processes which I’ve been advising clients around for the last decade. I can tend therefore want to ‘takeover’ the process from HR as I’ve always set a high bar in terms of entry requirements. I believe that when you have an exceptional team, you are undertaking on behalf of everyone to select a joiner that will maintain (or even push) the standard, someone who bring complementary skills and attributed, someone who brings something new and unique while still ‘fitting’ within the team dynamic. There are times when I realise I am looking for a needle in a haystack but I would rather take more time to find the right candidate. For candidates for my team, we undertake a rigorous process. CV screening, HR interviews, psychometrics, fit interview and assessment centre. In the assessment centre, I would invite assessors from different teams who may be able to assist in getting perspective on the candidate from an ‘internal customer’ perspective. I also try and select people to be part of the process who are very different from me in style so that I know any of my own thoughts or biases will be challenged. I think it’s important that the stigma around this in the workplace is challenged. To me, this is no different from an employee sharing any other aspect of themselves with me that is one of the many characteristics of being human that makes each one of us unique. I do not assume to understand the root cause or the implications – this is one of those moments where it is imperative to suspend judgement. Often I hear people jump to the conclusion that this could be a sign of inherent weakness or that this will be linked to lower job performance for example. Some of the strongest, highest performing people I know have tackled this silent struggle. I think its wrongly assume that as a manager you will need to ‘contain’ breakdowns and outbursts when an employee has been diagnosed. However, creating a conducive work environment for an employee who may have a diagnosis of any condition is not that dissimilar from what you need to be doing as a manager in any event. The environment should be a place where people are enabled to perform, where workloads are fairly managed, where the expectation is clear and feedback is timeous. Where allowances are made – there can be a frank and respectful discussion about boundaries and implications. Take the following example… an employee approaches you to discuss a surgery required which will results in four weeks recovery time. As a manager, you would seek to understand the impact on the business and then set parameters in line with HR guidelines. So perhaps some time will be covered by sick leave allowances and some will be unpaid, a handover and a handback plan must be agreed etc. Discuss with the employee what accommodations will be required on return – half day at first, changes to the workspace, a closer parking bay etc. Is it any different if an employee required psychological support? Perhaps if they are attending a therapy session once a week then discuss how the hours can be made up elsewhere or if it’s an intensive recovery period if time off or reduced working hours are required. If the individual is starting on medication, understand if its likely to have any short-term impacts on concentration so you know you may need to expect energy dips or take more time to QA. If you have a trust relationship with the person then they may share with you their own warning signs so, as a manager, you are better able to gauge their responses and behaviours. I value purposeful transparency. If I have a genuine interest in specific aspects of organisational operations or future planning then I expect that I will be enabled to gain a more in-depth understanding. That being said, I do not expect to sit passively and be ‘fed’ black and white answers. This is mirrored with my own approach with my teams. There is important information that is readily available and should be imparted regularly. It is important that everyone is the team knows how to access this information and feels completely comfortable to ask questions. Where there is a genuine interest to know more, I would work with the individual or the team to share and connect, where appropriate. It’s a fine balance between managing information overload, ensuring information is accurate (sharing half-baked plans can do more damage than good) but still maintaining a culture of openness. I don’t believe this is a decision that is best made by one person. Exiting an individual from an organisation has an impact on the collective. The impacts are often underestimated and therefore in an attempt to ‘contain’ the situation it can be managed quite autocratically. I believe in the potential of all people to develop, grow and change. Therefore individuals should be given the maximum opportunities to demonstrate how they are able to contribute to an organisation. The ideal exit situation is where both parties have come to the full realization that there is a fundamental mismatch between the organisation’s requirements and the current ability, capability or motivation of the individual. There should be a sense of shared accountability and self-reflexivity. · Did we do everything we could to enable this person to perform? · Are the expectations fair? · Did the individual have a realistic preview of what would be required? · Has our organisation changed in a way that no longer aligns with the needs of some of our employees? · Did I give it my all? · Have I identified any specific development areas that would be useful for me to work on as I move forward? · Did I ask enough questions about the role or the company – what would I do differently in future? · Have I gained insight into driver and motivators that are non-negotiable for me in a role or organisation so I don’t compromise in future?